Through the windows of Beecher's Handmade Cheese plant, passersby watch the cheesemakers practice the centuries-old craft of making cheese. 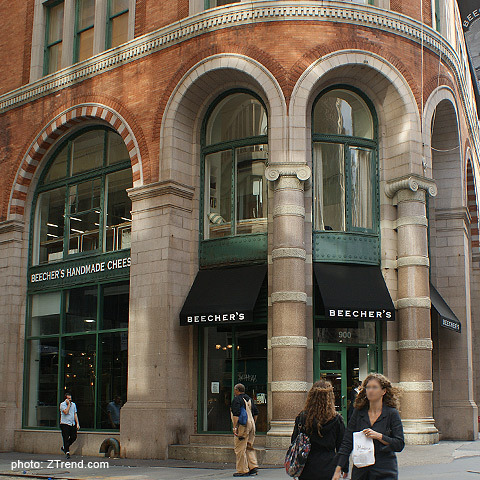 Beecher's churns fresh daily batches of cheese made from the milk of healthy cows raised without added growth hormones. Make your selection from over 85 different varieties of cheese produced by local cheesemakers throughout the U.S. Shop specialty books along with an abundant variety of gourmet goodies such as chocolates, jarred condiments and crackers. Enjoy small bites in the upstairs cafe, or pair your lovely delicacies with a fine glass of wine in Beecher's downstairs cellar, where the ambiance is intimate enough for two, yet the roomy communal tables are fit for a gathering. Expert cheesemongers can help with making your final selection from their menu of cheesy dishes. Store & Cafe: Monday - Sunday: 8 a.m. - 8 p.m.
Over 85 different domestic handmade artisanal cheeses.